Britt-Heléne Bonnedahl Director, Master Faculty, NLP practitioner, Mental trainer. She is the founder and director of Rönninge Show Chorus: http://www.ronningeshow.com. Rönninge Show Chorus (RSC) is a world-class competitive female barbershop chorus. With over 160 female members, spanning ages 16-80, they perform four-part harmony chorus music in concerts, competitions and at corporate events. Formed 1983 in Rönninge, Sweden, RSC has been fostering and educating singers nationally and internationally ever since. They are 2014 and 2017 International Chorus Champions, Sweet Adelines International, with the highest international score in history. Britt-Heléne´s profession has been being a special-teacher and speech-therapist for more than forty years parallel to the carrier as being director . She is Master Faculty within the international organization Sweet Adeline s International. Throughout the 36 years as a director she has been the coach for choruses and quartets all over the world. Within the chorus she has coached three winning quartets and several other singing and acting groups. 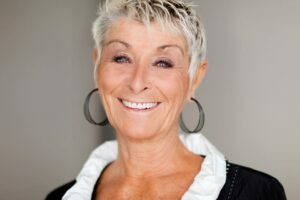 She has always combined the mental aspect in singing and performing and after becoming certified NLP-practitioner and mental trainer the chorus and groups she works with has been even more successful. With generous and positive attitude she wants to share the factors for success in her ongoing work with singers and performers.